Buy Meridian Organic Smooth Almond Butter 170g in the UK from our online shop or directly from our independent Scottish store. Jerusalem Artichokes are a real winter vegetable, don’t worry too much if you produce a lot of, er, ‘wind’ the next day, that’s completely normal because Jerusalem artichokes contain a fibre called inulin which ferments rather than digests, thus creating gas. Some good independent greengrocers will stock these knobbly roots, but if you can’t find them, you can always substitute with parsnips. This recipe contains Almond butter. A healthy porridge made with millet grain, raspberries and dates. Use frozen (mixed) fruit for a year round breakfast. This recipe contains 1 tsp almond butter. Berries are in season now, so make the most of them! This recipe contains 2 tbsp Meridian almond butter. Sourdough bread is available from our shop from Tuesday! This recipe contains 2tbsp Meridian Smooth Almond Butter. Use seasonal vegetables like celery sticks, carrots and sweet or bell peppers. This recipe contains 4 tbsp Meridian almond butter. Where can you buy real Organic Almond Butter 170g safely online? 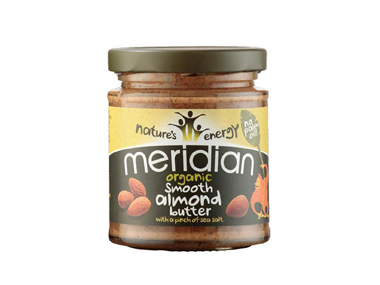 If you are wondering where you can buy Meridian Organic Smooth Almond Butter 170g safely online in the UK, then shop with us.